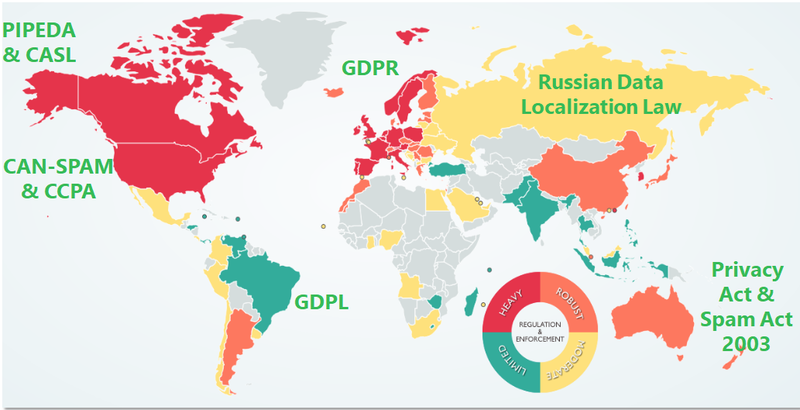 I recently gave a presentation on global privacy regulations to a post-graduate marketing class and one of the things I noticed while preparing was that even within a single country, privacy is complicated. On a global scale, it is really complicated. For example, Canada has one federal private sector privacy law, three similar provincial laws, separate laws on government managed data, three more on health privacy, and four more dealing with employment privacy. That makes my life as a privacy expert complicated enough, but what happens when I look beyond my local borders? Over the last couple of years, we’ve seen a rise in state-level laws laying a patchwork of standards across the US, including sectoral regulation on privacy, 50 different breach notification laws, and the new California Consumer Privacy Act (CCPA). While the CCPA and the GDPR are similar in some senses, the two laws are vastly different when it comes to the scope of responsibilities for businesses and the rights of the individuals whose data is covered. The reason GDPR had so much impact is that a significant number of global businesses transact with countries in the European Union and its 550 million residents. With California’s GDP amounting to what would be the equivalent of being the fifth largest country in the world, the CCPA legislation should be well understood by any company hoping to transact business with California citizens. It’s important to understand the impact of these two regions, and how these two laws will impact both local and international economies for businesses operating within their respective jurisdictions. Based on the questions we keep receiving on the CCPA and the GDPR, it is hard for most people to stay up-to-date on all these changes, especially when trying to understand the key differences and similarities when it comes to relating this to your marketing efforts. With that in mind, we’ve built a summary of the key points, both similar and dissimilar, of the CCPA and the GDPR. Finding easy-to-understand comparisons can be challenging, but we hope you enjoy the brief rundown we’ve assembled for you. While this won’t be able to replace your legal council’s advice, our hope is that it allows you to gain a further understanding of the requirements and differences between these two complex pieces of legislation. Special thanks to Derek Lackey, Newport Thomson, and Senny Boon, Email Experience Council for their review and input into this document.